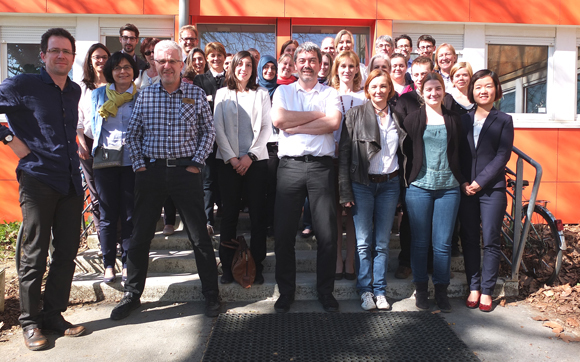 A workshop on the development of an European database on human cases of alveolar echinococcosis was held in Besançon on April 24-26. Thirty-five participants from Germany, Austria, Belgium, Italy, Latvia, Poland, Romania, Slovakia and Switzerland, with an observer from China, discussed on the best strategy to harmonize the census methods of human cases and adopt the database system set up at Besançon in the OREAS project (OSU THETA / Chrono-environment). Chrono-environment, supported by the GDRI EHEDE, positions itself as the European leader on this issue and allow the scientific community the opportunity of eco-epidemiological studies of this zoonotic disease in a previously unattainable spatial scale. The next step will be the inclusion of China, the most endemic area in the world, in this database system. Organizing committee: Florent Demonmerot, Jenny Knapp, Laurence Millon, Francis Raoul, Dominique Vuitton.